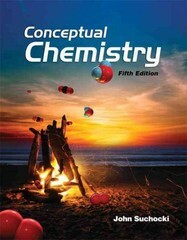 Conceptual Chemistry 5 Edition A long-established leader in liberal arts chemistry, John Suchocki’s Conceptual Chemistry continues to take a student-centered approach in the new Fifth Edition. This robust program uses a conversational writing style to engage and involve non-science majors, helping them visualize the behavior of atoms and molecules to understand our macroscopic environment. With a focus on fundamental concepts – not mathematical models.